Inshore water temperatures on the north end of the Grand Strand are around 68-70 degrees, and the water has gotten dirty. 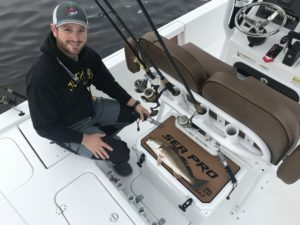 Even though catches have been pretty consistent, Captain Patrick “Smiley” Kelly (843-361-7445) reports that there have been some difficult fishing conditions with the wind during this transitional fishing season. The best thing going right now is probably the flounder fishing in the Cherry Grove area, which has gotten really good. Cherry Grove is the typical hot-spot during this period on the north end of the Grand Strand, and this year is no exception. Drifting live mud minnows on a Carolina rig around the tide cycle is working as long is there is current. In the Little River area the best pattern has been fishing docks in 5-6 feet of water for both redfish and black drum. The best time to fish is the lower stages of the tide when there is still a little current, and on windy days anchoring at docks provides a fishable pattern. Fresh cut shrimp and live shrimp will catch both species, while mud minnows will work for the reds. Crabs will probably also work for both species although Captain Smiley’s boats have not tried them. The trout bite has slowed down substantially, with up-and-down temperatures a likely culprit. Once temperatures stabilize it should get better again. At the jetties sharks are thick, and Captain Smiley’s boats have caught Atlantic sharpnose and even a small bull shark. Cherry Grove Pier (843-249-1625) reports that fishing is starting to get really good off the pier, and lots of small bluefish are being caught. Small Spanish mackerel are also showing up, and they have also gotten whiting and occasional flounder. One flounder has been big enough to keep so far. 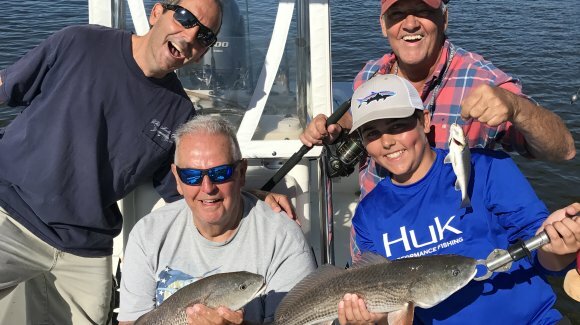 On days when you can get offshore Captain Smiley reports that nearshore at the 3-mile Caudle Reef weakfish, small bluefish, trout, and small black sea bass are around. Inshore water temperatures on the north end of the Grand Strand range from about 57 to 58 degrees, while the ocean is around 61. Overall the water is still pretty clear. 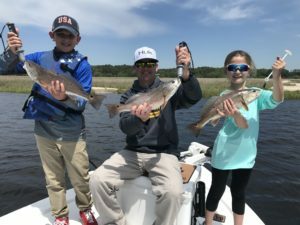 Fishing in the Little River area is excellent, and Captain Patrick “Smiley” Kelly (843-361-7445) reports that their main focus continues to be trout. Not only are they extremely plentiful, but when there are lots of huge fish in the 25-30 inch range being caught it’s hard not to focus on the gators! The key for catching the biggest fish has been drifting out at the jetties with live shrimp, which are still available at Captain Crumb’s Outpost off 501 in Myrtle Beach. They are consistently catching the big ones floating live shrimp down the rocks on either the incoming or outgoing tide as long as there is some current. They are fishing the bait 5-8 feet down on a suspended cork right off the rocks. Some nice redfish in the 24-28 inch range are also being picked up this way. Inside the creeks they are also catching trout on live shrimp as well as mud minnows, with the best action coming over either shelly or sandy bottoms on the low to rising tide. Gulp and Vudu Shrimp are also working, and about anywhere you stop you can catch lots and lots of small trout. There are also some good ones inside the creeks, and unlike the ocean fish they seem pretty happy with live baits or artificials. They are also picking up some nice reds inside the creeks, particularly in deep holes with 5-12 feet of water. Black drum are feeding pretty well around docks on live or cut shrimp, but since they aren’t as finicky cut shrimp is the more cost-effective choice. They are also being found around drop-offs in the ICW, with the best action coming in five feet of water or less. You need current whether coming in or going out. A few flounder are being caught, and about each trip they seem to get one keeper. Very soon they should be plentiful in the Cherry Grove area, the first place they show up each year. Cherry Grove Pier (843-249-1625) reports that in the last few days they have been doing really well for whiting, and there have also been some bluefish caught. Last weekend there were a fair number of trout caught off the pier. Nearshore Spanish mackerel are starting to show up as well as bluefish and dogfish. At the 3-mile Jim Caudle Reef black sea bass are becoming prolific. Inshore water temperatures on the north end of the Grand Strand range from about 56 to 60 or 61. While clarity is still good, snot grass is showing up typically for this time of year and so anglers are constantly having to clean it off of hooks. It’s hard to lead off with anything besides trout when they are catching fish in the 10-pound range! Captain Patrick “Smiley” Kelly (843-361-7445) reports that out at the Little River jetties Captain Chris Ossman of his guide service has recently caught several fish in the 27-30 inch range, including the 30-inch fish pictured below. The closest place where live shrimp are available is at Captain Crumb’s Outpost off 501 in Myrtle Beach, but it’s worth going because they have been making the difference for monster specks. Drifting shrimp over the rocks under a slip bobber on the outgoing tide has been the ticket. Adjust the depth until you find where the fish are holding and want to eat on a particular day. Inshore there are also some trout being caught on the falling tide around oyster beds on live mud minnows. They will of course take shrimp, too. Redfish can also be picked up in the Inlet, and they are also catching red and black drum inshore. Tuesday Captain Smiley caught eight nice redfish between 18 and 26 inches to with the other species targeted. The best action has come on the incoming tide in very shallow water where there are 2-5 foot potholes in shallow creeks. Because they are targeting both redfish and black drum fresh cut shrimp is the bait of choice. Cherry Grove Pier (843-249-1625) reports that surf temperatures are around 57 degrees, and the catch mainly consists of whiting and small croaker. The ocean is clear. Inshore water temperatures on the north end of the Grand Strand have risen all the way to 59 degrees; although the water is clear breezy conditions this week have reduced visibility. Even as temperatures warm redfish continue to be in the same type of places they have been much of the winter, and Captain Patrick “Smiley” Kelly (843-361-7445) reports that on the falling tide today they have been able to pick up some creek fish by positioning the boat in shallow water and casting into little holes with 3-4 feet of water. Sometimes low tide redfish will be in such shallow areas that they can not even be accessed with a boat, and at times Captain Smiley will get out and walk in hard, sandy creeks. Fish are primarily in these spots hiding from dolphins looking to feed. When fishing the dropping tide you have to be conscious of water levels so you don’t get stuck. Fish can also be caught on the flats, and at this time of year the best conditions on the flats are low to rising tide in the middle of the day when the shallow mud flats can warm. You can spot them just laying around, pushing water, or you can see puffs of mud where they have been. Artificial baits like Vudu Shrimp, Gulp! baits in New Penny, and mud minnows fished under a popping cork have all been working, but Captain Smiley points out that you will miss a lot of fish right now. Every year at about this time they bite funny, grabbing half of the bait and sometimes spitting it out. Trout can still be caught in the Intracoastal Waterway around drop offs in 5-10 feet of water, and they will also be around moving water near oyster banks. Today they have mainly been catching smaller fish in the 13-inch range, but there are better fish around too. Gulp! baits on a ¼ ounce jighead are working. Fish can be also caught at the jetties, where the best pattern remains fishing live mullet, mud minnows or ideally shrimp under a slip bobber. Drifting the bait with the current in 4-10 feet of water is the best pattern, which usually means keeping the bobber about 5-10 feet off the rocks. Any closer than that and the bait will usually get hung up. 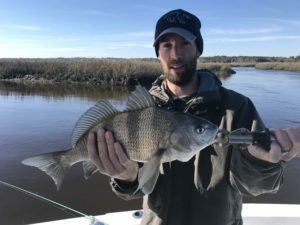 There is still a good bite for smaller black drum, with some of the fish keeper-sized. On the ledges fish can be caught in about 10 feet of water on small pieces of cut shrimp. Cherry Grove Pier (843-249-1625) reports that surf temperatures have risen to about 50 degrees but only a few small whiting have been caught. Inshore water temperatures on the north end of the Grand Strand are still about 46-48 degrees. Clarity is winter normal. 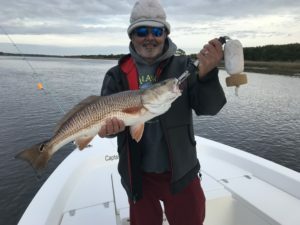 Fishing for redfishhas been up and down this week, and Captain Patrick “Smiley” Kelly (843-361-7445) reports that even though they had some good days extremely low tides were too late in the day to be ideal for fishing. Things should be much better going forward. At this time of year the best conditions for fishing is a low to rising tide in the middle of the day when the shallow mud flats can warm. Even though the fish are in a semi-lethargic state, they will eat. You can spot them just laying around, pushing water, or you can see puffs of mud where they have been. Redfish can also be caught in the creeks, and they will get into small tidal pools with 4-8 feet of water. The fish are not visible to anglers, but primarily they are in these spots hiding from dolphins looking to feed. Sometimes they will be in super shallow areas that can not even be accessed with a boat, and at times Captain Smiley will get out and walk in hard sandy creeks. Trout can be caught at the jetties as well as inside the creeks. Out at the jetties the best pattern is fishing live mullet, mud minnows or ideally shrimp under a slip bobber. Drifting the bait with the current in 4-10 feet of water is the best pattern, which usually means keeping the bobber about 5-10 feet off the rocks. Any closer than that and the bait will usually get hung up. There is also good trout fishing in the Intracoastal Waterway. Fish will not be on the flats but around drop offs in 5-10 feet of water, and they also look for moving water. Live finger mullet have been working well, with the best action usually on the rising tide but some fish also being caught on the incoming. Cherry Grove Pier (843-249-1625) reports that surf temperatures have dropped to about 50 degrees and the catch is limited to a few whiting, black drum, and the occasional flounder. jay@usfishingreport.com-10 feet off the rocks. Any closer than that and the bait will usually get hung up. Inshore water temperatures on the north end of the Grand Strand have warmed up to 56-58 degrees. Because of rain, wind and warmer than usual temperatures the water is not as clear as usual at this time of year. 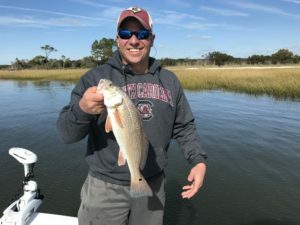 Probably because of the unseasonably warm weather, Captain Patrick “Smiley” Kelly (843-361-7445) reports that fishing is excellent right now for a variety of species. 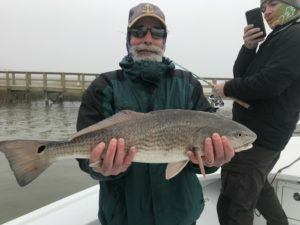 They are catching a lot of slot-sized redfish as well as over-the-slot fish, and even though it’s winter fish are not grouped up in huge schools. Frankly the fish are not in that different a pattern from what they have been in. Fish can be found around oyster beds, docks, and on the flats, and both the incoming and outgoing tide have been productive in the right places. The trout bite is still good, and they are catching fish in 5-10 feet along the ledges in the Intracoastal. Both live mud minnows and Vudu Shrimp are working well, and while the best action has generally come on the rising tide yesterday they caught some fishing on the outgoing. Captain Smiley’s boats have evened picked up some small flounder lately! Cherry Grove Pier (843-249-1625) reports that surf temperatures have risen into the upper 50s, and as a result some fish have come closer to the beach. There has been a pretty strong whiting run for January, and they have also caught some bluefish and a few flounder up to 16 inches. Starting The New Year off Right!! Inshore water temperatures on the north end of the Grand Strand are in the low 50s, and the water is seasonably clear. 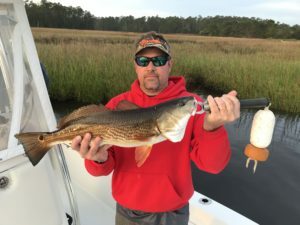 There’s good action to be found in the Little River area, where Captain Patrick “Smiley” Kelly (843-361-7445) reports that the trout bite is the best thing going. They are catching trout along the ledges as well as out at the Little River jetties, and both live mud minnows and Vudu Shrimp are working well. 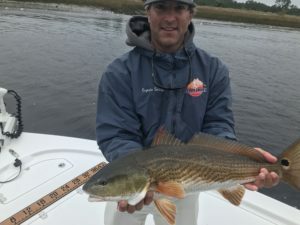 Redfish have also been very welling to eat, and Captain Smiley’s boats are catching a lot of bigger fish over the slot. Mud minnows fished under a popping cork have been productive around oysters beds, docks and grass edges in the IntraCoastal. Fish are schooled up tight and the best action has been on the incoming tide. Inshore water temperatures on the north end of the Grand Strand are around 55 degrees, and after some extremely high “king” tides last weekend the water is a little dirty. 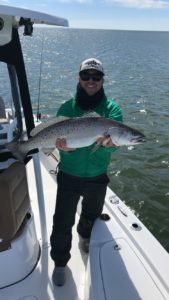 It’s still a good time to fish in the Little River area, and Captain Patrick “Smiley” Kelly(843-361-7445) reports that they continue to catch a lot of small trout. Fish can still be caught in a lot of different places, but casting to ledges in about 10 feet has been very productive. Stage of the tide does not matter as long as there is moving water. By now they are pretty much fishing with artificials, including Gulp! And Vudu Shrimp. White and chartreuse have been the best colors. It’s getting late in the season but some flounder have also been picked up fishing the ledges for trout. 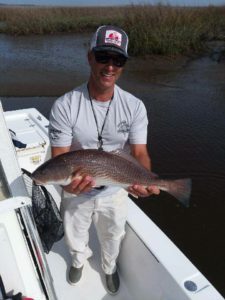 Redfish and black drum have both been together, and fishing with fresh, cut shrimp Captain Smiley’s boat has been picking up both species around docks and particularly around docks near shelly bottoms. The best bite has been on the incoming tide in 3-8 feet of water. Cherry Grove Pier (843-249-1625) reports that surf temperatures are still about 60 degrees, but there is very little being caught off the pier. Some small whiting and undersized black drum are about the extent of the catch. Inshore water temperatures on the north end of the Grand Strand are down to the lower 60s, and the water has cleared up. As would be expected on the South Carolina coast in the fall, Captain Patrick “Smiley” Kelly (843-361-7445) reports that inshore fishing is good for a mixed bag of species. Plenty of trout are being caught, and the only downside is that overall the fish are pretty small with relatively few keepers mixed in. They will take most anything white, including live shrimp as well as Gulp! shrimp in white with a chartreuse tail. Fish seem to be literally everywhere, and they can be caught around channels, sand bars, oyster beds, drop offs, and anywhere else that provides some sort of transition. They are deep and shallow, and can be caught throughout the tide cycle. Redfish are also biting well, particularly around grass and oysters. They can be caught on Gulp! and cut mullet with most of the fish fairly shallow. A few black drum are being caught on fresh or live shrimp fished around docks on the incoming tide. Even though it’s getting late in the season, there has continued to be a pretty strong flounder bite. On the outgoing tide they caught some nice fish on Gulp! baits yesterday afternoon. Cherry Grove Pier (843-249-1625) reports that surf temperatures are about 60 degrees, and spot, whiting, croaker, black drum and the tail end of the pompano have been caught. Some bluefish were also caught off the pier yesterday.